I was going to write something about programming today, but I decided to put that off until later. 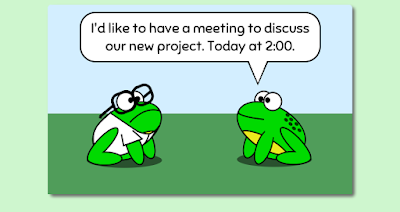 Just kidding - procrastination was the subject of today's Amphibian.com comic! In reality, I never planned to write anything today. Since I'm clearly writing something anyway, let me talk for a minute about Beat Panels. I used one today in the comic. It's the next-to-last frame, the one which contains no dialog. It's just Science Frog and CEO Frog staring at each other. Beat Panels are typically used to indicate the comedic pause before a punchline, or to indicate the quiet contemplation of the characters. I think this is the first time that I've used one. In the case of today's comic, the pause was meant to make the reader think about the nature of time and how we perceive the present. All of our perception is the present. We can remember the past and anticipate the future, but we only experience the present. A year from now, it will be the present. A hundred years from now, it will still be the present. The present is all we've got. Use it to read my comics.